Looking for an impressive brunch recipe? We’ve got you covered. 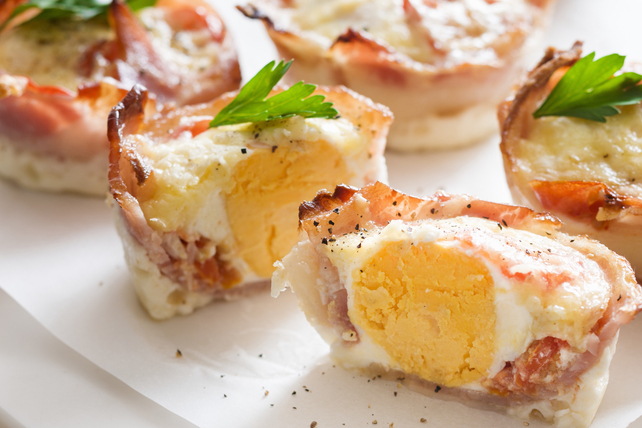 These individual Egg Drop Breakfast Cups have it all - tomato pesto, melted mozzarella cheese, crisp puff pastry and perfectly cooked eggs. What more could you ask for? Unfold pastry sheet on lightly floured cutting board; cut into 12 squares. Use to line 12 muffin pan cups, being careful to not let edges of pastry squares touch each other. Gently place ham piece over pastry in each cup. Spread ham with pesto. Slip 1 cracked egg into each prepared cup; top with cheese. Bake 18 to 20 min. or until egg whites are set and pastry is golden brown.